The latest member to join IFSW, the Social Workers’ Association Nepal (SWAN) and Nepal School of Social Work had a joint meeting with the Norwegian Union of Social Educators and Social Workers on November 12, 2014 in the Nepal School of Social Work premises at Buddhnagar, Kathmandu . SWAN was established on June 29, 2014. It became a member of IFSW on 31 October 2014. 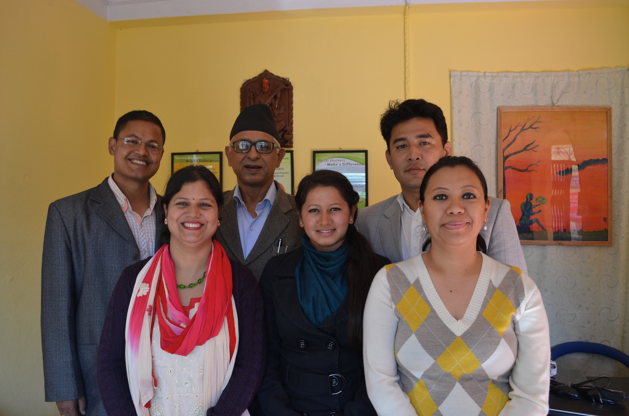 The aim of the meeting was to share experiences of practice and the development of social work in Nepal and Norway. President, Dr. Dilli Ram Adhikari of SWAN said that the role of SWAN is vital in strengthening professional social work practice, education and research. This would then improve the situation for deprived and marginalized people, individuals, groups and communities by strengthening lives to achieve stronger social, economic, psychological and spiritual goals. Dr. Bhola Prasad Dahal, governance advisor of the Royal Norwegian Embassy, explained that the Norwegian Embassy has been providing support to the Government of Nepal on the infrastructure of the country, for example in education, renewable energy development, and governance. He stressed the importance of professional education of social workers in Nepal. In particular its critical contribution to helping policy planners and decision makers in their understanding of the role of social work and social development. The debate should make them clear about the importance of professional social work education and its importance to meet human development goals. Ms. Pradipta Kadambari, Chief Executive of the NSSW explained how it has been contributing in promoting quality social work education in Nepal since 2005 by offering Bachelors’ level degree in Social Work. She went on to say that professional social work educators were very supportive of the need for the Social Workers Association in Nepal and that one umbrella for both practitioners and educators strengthened the social work identity. The challenges for SWAN include maintaining a quality professional education, to secure well resourced services in practice, to raise the profile and understanding of the role that social work takes in social development were highlighted by founding member of SWAN Om Krishna Shrestha. SWAN as a National organization aims to promote social work education as profession by providing technical support to its members so as to cope with the problems arising in social development field. Mr. Rune Soma, the Executive Officer of the Norwegian Union of Social Educators and Social Workers has shared the experiences and challenges of social workers in Norway. He emphasized that social work is recognized as a profession and most of the social workers are either state government employees or municipal employees and that female social workers are higher in number. He assured SWAN of the continuing contact and experience sharing through the bodies of IFSW, and to look for possibilities for developing contact between the Nepal School of Social Work and university colleges educating social workers in Norway. Director Looniva Chitra of Community Based Rehabilitation Center(CBR) Patan reflected on the challenges for intervening with differently able children due to existing circumstances in the society. Activists in the field of mental health founding President Matrika Prasad Devkota of KOSHISH shared practical evidence of people with mental health issues and their reintegration in families and society. It was a golden opportunity for practitioners to work with the social work educators and social work students from the Nepal School of Social Work to build the capacity of our organization. The Vice President of SWAN Krishna Sundar Khaitu thanked all the delegates from Norwegian Union of Social Educator and Social Workers, alumni, students and faculties of Nepal School of Social Work as well as social work practitioners from Community Based Rehabilitation Center, KOSHISH and governance advisor of Royal Norwegian Embassy who made this programme of sharing to so productive and meaningful. The programme was coordinate by the Secretary of SWAN Samjhana Bhetwal and Treasurer Baidhya Ghale.